In 2012, Trump was to Romney what David Duke is now for Trump—a conduit to Obama-hating white voters. Mitt Romney, the 2012 Republican presidential nominee, has finally found his conscience, his spine and his voice, and plans a speech Thursday to denounce the 2016 GOP presidential front-runner Donald Trump. It’s a sad end to a once-promising romance. To be fair, at times during that odd 2012 tableau with Trump in Las Vegas, Romney looked bewildered, as New Jersey Governor Chris Christie did standing next to Trump on Tuesday night; a flash of Stockdale-ian “Who am I? Why am I here?” befuddlement occasionally flickered across his tanned, chiseled face. But why, you might ask, did GOP candidates slavishly seek Trump’s endorsement in 2012 and not, say, in 2008? (Trump did endorse Senator John McCain in September of that year, but without fanfare or public courtship, on the Larry King show, and he admitted his enthusiasm was for Sarah Palin. Of course.) How did Trump Tower become a stop on the GOP campaign trail, alongside a stop for corn dogs at the Iowa State Fair, trips to court the New Hampshire Union Leader, a sojourn to the Reagan Library? What turned Trump from a self-promoting blowhard, real estate mogul, and reality TV star into a political powerhouse? On what issue, or issues, had he built his political reputation? Only one: He was the birther in chief, the highest-profile purveyor of the racist and destructive fiction that President Obama wasn’t born in the United States and thus wasn’t a legitimate president. Did Romney denounce Trump’s birtherism, or make it clear he was accepting the endorsement despite the insults to the president, not because of them? Nah. 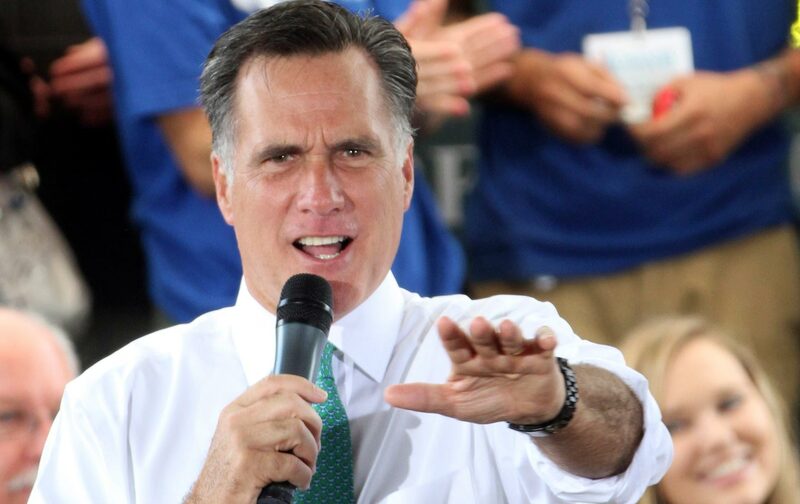 “You know, I don’t agree with all the people who support me and my guess is they don’t all agree with everything I believe in,” Romney genially told reporters aboard his charter plane in May 2012, when asked about Trump’s anti-Obama birther crusade. “But I need to get 50.1% or more and I’m appreciative to have the help of a lot of good people.” Since he’d written off “47 percent” of American voters as Obama-loving takers—“I’ll never convince them they should take personal responsibility and care for their lives”—it was an especially tough lift to get to 50.1 percent, and Romney never did. Not only did Romney refuse to denounce birtherism, he joked about it. “No one’s ever asked to see my birth certificate,” he told a crowd in Michigan, one of his many home states. When Trump revived his birther antics on the eve of his televised Romney endorsement, it was left to CNN’s Wolf Blitzer to rebuke him. “Donald, Donald, you’re beginning to look a little ridiculous,” Blitzer told him. Trump retorted: “Frankly, if you would report [the birther conspiracy] accurately, I think you would probably get better ratings than you’re getting, which are pretty small.” Obviously, the networks have taken Trump’s advice: His every utterance now preempts regularly scheduled programming on the cable stations. Now, Romney has already sounded the alarm about Trump in this campaign cycle. “He’s someone to whom civility means a lot. The whole Trump thing really bothers him,” a close associate told New York magazine’s Gabriel Sherman in September. But it was apparently Trump’s refusal to denounce or rebuke former KKK Grand Wizard David Duke, on CNN last Sunday, that led to Romney’s Thursday speech. Let’s recap: Trump refused, repeatedly, to publicly rebuke Duke because he’s running a campaign of “Leave no racist behind,” and there was insufficient political capital for him to denounce the KKK, or even “white supremacy,” on the Sunday shows. He left that to Twitter, later, and then he told reporters he hadn’t heard CNN’s questions clearly. This is ludicrous; he heard well enough to repeat the words “David Duke” and “white supremacists” during the interview; he heard well enough to denounce them, if he had wanted to. But he wants their votes. That sounds kind of familiar. In 2012, Romney was running a campaign of “Leave no Obama-hater behind,” which isn’t far from Trump’s electoral goal. And he benefited from Trump’s support the way Trump benefits from David Duke’s: Each of these GOP candidates believes he needs the backing of the racist, Obama-hating fringe. So Trump hemmed and hawed before, reluctantly, publicly denouncing Duke and the KKK Tuesday night. But hey, it only took two days; it’s taken five years for Romney to publicly denounce Trump. That’s not an entirely fair comparison; Trump’s birtherism is and was odious, but it’s not the same as the once-violent, still virulent racism of Duke and the KKK. Where Romney telegraphed Obama-loathing to racist whites with dog-whistles, Trump has used a bullhorn. Courting Trump wasn’t the same as courting white supremacists. But as a lot of us recognized and wrote back then, it was on a continuum with it. Romney lacks the moral authority to make a compelling argument against Trump unless and until he apologizes for courting his endorsement in 2012. I won’t hold my breath.